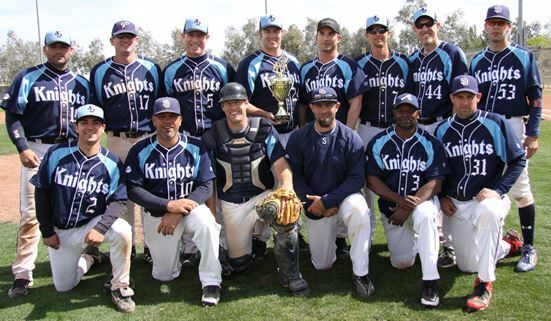 Las Vegas — Peccole Park, March 12, 2012 – Jason Bendorf allowed one earned run in five innings, and Dave Ebright threw three scoreless innings and of four-hit relief as the San Diego Knights 13 defeated the So Cal Buzz 2. Essex Burton, a one-time Chicago White Sox prospect who played 10 years of minor league and independent league ball, had three hits, three RBI, scored three runs, and stole four bases. The game was touched by controversy as the Knights filed a protest to say that Buzz starter, Michael Kesten, was not eligible to pitch in the game. The Knights cited Kesten’s Facebook entry which referenced plans to go to Vegas to pitch in the finals, as exhibit A. The Buzz argued that Kesten had in fact been at a previous game in accordance with tournament rules, and tournament organizers, who looked into the matter, were satisfied that Kesten had been there earlier in the tournament. The Knights scored four times in the first three innings off the confident left handed Kesten. With a 1-0 lead, and two out in the bottom of the third inning, Nick Nunes scored on Burton’s single. Burton stole second, stole third and scored on an infield error. Sean Moran, who boarded on the error, stole second and scored on a single by Ryan Martin. The inning ended when Martin was thrown out stealing. The Buzz threatened in the top of the fourth inning when, with runners on second and third and two out, Carlos Ramos’ short fly ball toward the left field was caught by a diving JJ Fisher to end the inning. The Buzz buzzed again in the top of the fifth inning when Frank Medrano cranked a solo homer off of Bendorf. Jonny Kaplan added an RBI single. Then things got a bit out of hand. The Knights scored five times with two outs in the fifth inning. Burton, who terrorized pitchers throughout the tournament from the leadoff spot, came to the plate with runners on second and third with two out. Despite the fact that the number two hitter was hitless, Kesten pitched to Burton who promptly rocked the first pitch he saw for a double off the wall in left center field. Catcher Mike Scharbarth added a two-run single in the rally. That was enough to chase Kesten who allowed nine runs, three earned, and six strikeouts. The Knights stole 12 bases in the contest.